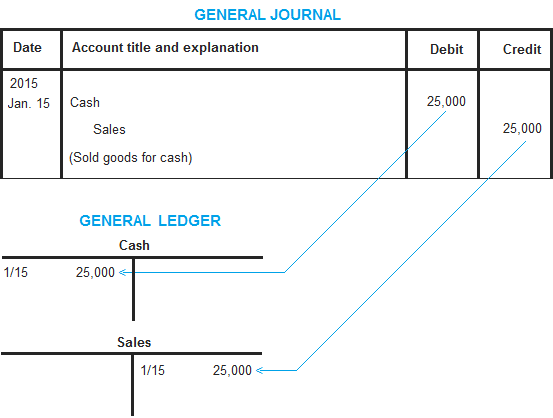 Posting from general journal to general ledger (or simply posting) is a process in which entries from general journal are periodically transferred to ledger accounts (also known as T-accounts). It is the second step of accounting cycle because business transactions are first recorded in the journal and then they are posted to respective ledger accounts in the general ledger. Ledger accounts are a way of presenting and grouping transactions relating to a particular account at one place. The book in which ledger accounts are maintained is known by various names such as ledger, ledger book or general ledger. The process of posting journal entries to ledger accounts is very simple. No new information is needed to prepare ledger accounts. The information that has already been recorded in the journal is just transferred to the relevant ledger accounts in the general ledger. For the purpose of posting to general ledger, we can divide a journal entry into two parts – a debit part and a credit part. Both the parts essentially contain one or more accounts. The amount of the account (or accounts) in the debit part of the entry is written on the debit side of the respective account and the amount of the account (or accounts) in the credit part of the entry is written on the credit side of the respective account in the general ledger. To have a better understanding of the posting process and to illustrate the format of ledger accounts, we need to take a transaction, prepare a journal entry and then transfer it to the relevant ledger accounts. Transaction: On January 1, 2015, US company sold goods to customers for cash $25,000. The debit part of the above journal entry is “cash account” and the credit part is “sales account”. So the amount of the journal entry ($25,000) is written on the debit side of the cash account and credit side of the sales account. 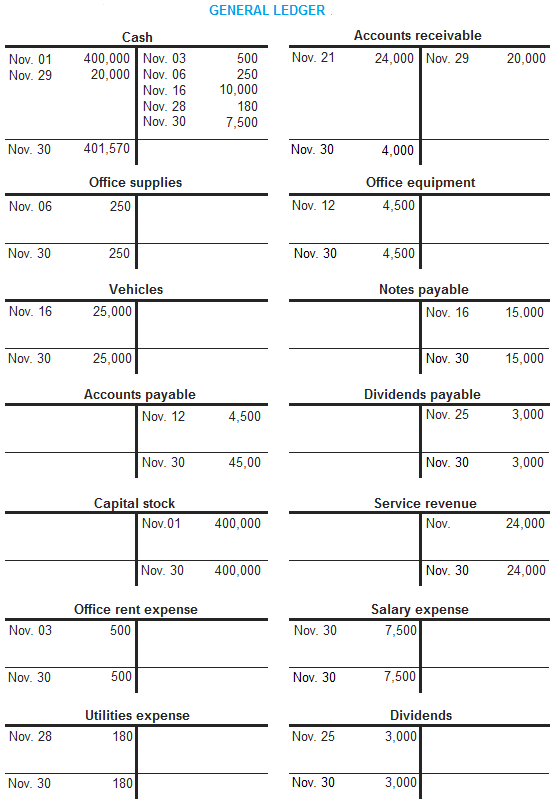 All journal entries are similarly posted to accounts in general ledger. We can prepare ledger accounts using journal entries of Moon Service Inc. prepared on the journal entries page. In a manual accounting system, the journal entries are prepared first and then transferred to general ledger at some later period. It may be a tedious and time consuming process for companies with numerous business transactions. A computerized accounting system, on the other hand, is more fast and more accurate. Once enough information is provided and the journal entry is correctly recorded, computer software automatically posts it to the relevant accounts in the general ledger and thus increases the efficiency in terms of speed and accuracy. I would like to know about declaring one account into another account and I heard this is sometimes done by taxation professional, they declare salary to procurement to be charged less. There is an error in Accounts Payable. Nov. 30th should be 4,500 not 45,00. Actually, there are a few mistakes on here. can you please me to by an example i mean a full transaction and the general ledger please .